What a great day! My friends Morten and his lovely wife Lene picked me up at about 3:45 and we drove over to Sweden and had a very nice chat. We arrived at KB about 4:30 and I saw some of the guys in the band but not Ed Mundell, whom I had planned to meet up with. I spoke to a roadie and ask him to tell Ed I was here. He and Dave were busy doing interviews so we just hung out. After 30 minutes Ed showed up and Morten and Lene went for some food and I went on the tour bus with Ed. He pointed out that the stupid people had put the Bullgod logos on the crew bus and not the band bus and you could not even see the one on the back because of the trailer! Anyway, we talked on the bus while Ed got his computer (Apple Laptop) so he could check his mail inside the club. He told me that he is no longer and will not ever play in Atomic Bitchwax again. That project is over. It is a long story. Anyway, we hung out and I talked with Tim Cronin a lot as well. The Quill did their sound check and it sounded really great. After the sound check they had the food for the bands. I ate with Tim. He is a really great guy. The new Ribeye Brothers CD is recorded and just needs some mixing and mastering. They are looking for a new label to release it. He is very happy with the results. After Dinner, Ed went to crash out. I just hung out in the club. It was an early show so the Quill was starting at 8. 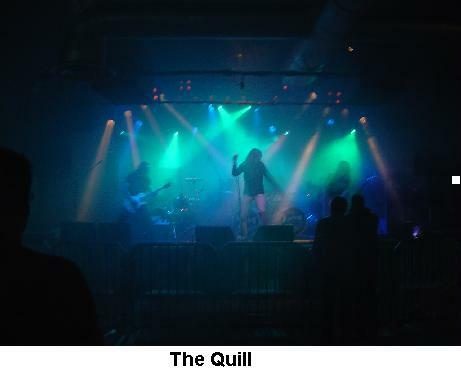 The club was sold out tonight and about 1/3 of the people were inside when the Quill started to play. They got a good reception and I really enjoyed their set. They sound like a cross between Trouble and the Screamin’ Cheetah Wheelies to me. A good jammy groove but a slight doom edge to it and a powerful singer. People were saying the band sounded like Soundgarden. I did not think so at all. The singer occasionally sounded like Chris Cornell but not that much. Cool rocking set. The place was pretty packed now when Gluecifer hit the stage. I had spent some time talking with these guys as they are good friends with my friends WE. I had not seen them since the Roskilde Festival back in 1999. They opened with the title track from their new CD, Automatic Thrill. The longer they played the more the people got in to it. They have a pretty basic hard driving sound in the same way the Hellacopters, older stuff was like. They played about 50 minutes. It did not take long before Monster Magnet hit the stage at 10 sharp. It was packed and hot as hell tonight. There is no room in this club for projections so Tim did not have it set up at all and just did the normal lights. I was backstage talking with Ed and Dave 10 minutes before the show and everyone was psyched to play. Dave was pissed though because they usually crank up some Grand Funk or something to get hyped for the show and his CD player was skipping on all the CDs. He was blaming the CDs though. Anyway, he was mad as hell. I grabbed a beer and headed downstairs to find a place. The band opened with Bummer and the crowd was totally into the Magnet. The sound was excellent but the drums were too loud in the mix but not so much to ruin it. The guitars were a bit low for the first song and ½ and then it was sorted out. Tractor was rocking, then we got some new stuff, Supercruel. Dave was not playing the rock star as much as on the God Says No tour. No long speeches, just rocking out with the boys and the crowd! 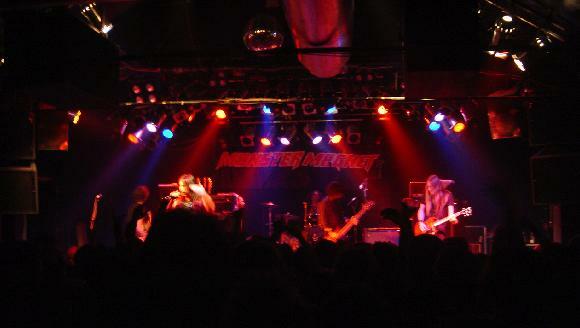 High Intensity Monster Magnet rock and roll. It was a great mix of the old and the new with such songs as Dinosaur Vacuum, Powertrip (a crowd favourite), Zodiac lung, Melt (great guitar solo by Ed on this song! ), and Hotel Baby. The new songs seemed to be well accepted. The best one by far was Radiation Day. It has a great heavy riff. The set ended with Negasonic Teenage Warhead and SpaceLord. The band came back for a great version of The Right Stuff and a long spaced out version of Spine of God. The crowd wanted more but that was it. About 90 minutes! I had a great time and went and saw the band after the show and said thanks and see you in a week. They were all really cool guys. Ed said they have rehearsed some extra numbers and that the band was playing them at Soundcheck to keep them fresh but they had yet to change the set yet. We can hope later in the tour to hear Dopes to Infinity, Snake Dance, Twin Earth and Evil! Incredible night. I will be back with the band in one week when they play my home town, Copenhagen!